More pets are lost on the 4th of July than any other day of the year. July 5th is the busiest day of the year for animal shelters nationwide. How sad (and scary) are those facts? While you are out having fun, remember your pets and pet safety on the 4th of July. Pets are often scared of fireworks and will injure themselves trying to find a place to hide from the noise. Even if your pet is usually an outdoor pet, fireworks are an exception to the usual noise they hear. Make sure your pet has a safe place INSIDE to escape. Close windows and doors to lessen the noise and play a fan or background music/tv to help drown out the pops and bangs. Just because it’s not toxic to humans does not mean it’s not toxic to pets. Pets lick their fur, we don’t lick our skin. Ingestion of sunscreen products can result in drooling, vomiting, diarrhea, excessive thirst and lethargy. Ingestion of insect repellents that contain DEET can lead to neurological problems. I don’t know about cats, but dogs love the taste of beer. Beware though, fermented hops and ethanol are poisonous to dogs and cats. Plus, dogs can easily become overly intoxicated and die from respiratory failure. Just as you keep tabs on your alcohol around your children, keep tabs on it around your pets. Contrary to popular belief, not all dogs can swim. My two dogs are a prime example. Bully breeds are top heavy and tend to sink well before they attempt to doggy paddle. My dogs have life jackets for when we are out on the boat. You don’t have to get a life jacket for your dog, just make sure that you are watching your dog around water. If you are at a beach with strong waves, watch for undercurrents that can sweep your dog away. Though it may be tempting to slip your pet a little something from the grill, resist that temptation. A sudden change in your dog’s diet can cause an upset stomach. Plus, some foods such as onions can be toxic to pets. Also avoid giving your pet left over bones. Cooked bones splinter easily and can get lodged in your pet’s throat or can cause tears in their intestines during digestion. While glow jewelry isn’t extremely toxic, ingestion of the fluid inside can cause stomach upset. Plus, pets can get intestinal blockage from plastic pieces if swallowed. It may smell good and keep bugs away but Citronella is toxic to pets.Inhalation can cause severe respiratory illnesses such as pneumonia, and ingestion can harm your pet’s nervous system. While it goes without saying that you shouldn’t light fireworks around pets, most people don’t realize that used fireworks left behind can make a tasty treat for some pets. Unfortunately, some fireworks contain potentially toxic substances such as arsenic, potassium nitrate, and other heavy metals. Chlorates, a chemical substance found in some matches, can cause your pet difficulty in breathing, damage blood cells or even cause kidney disease if ingested. Lighter fluid may cause skin irritation on contact, respiratory problems if inhaled, and gastric problems if ingested. Microchips are best but a properly fitting collar with a tag will work too. Even if you are planning on keeping your pet inside, make sure your pet has ID. My friend’s dog got so scared during fireworks that it broke a window and escaped out of the house. If it weren’t for the dog tag, she may never have seen her dog again! Speaking of ID…is the info on your pet’s tag correct? Is your pet’s microchip activated and up to date? I’ve found more than one stray animal with a microchip that didn’t have a working phone number! Though the above list may seem more relevant to dogs than to cats, please remember that cats are just as likely to be scared as dogs and are just as likely to ingest things as dogs. 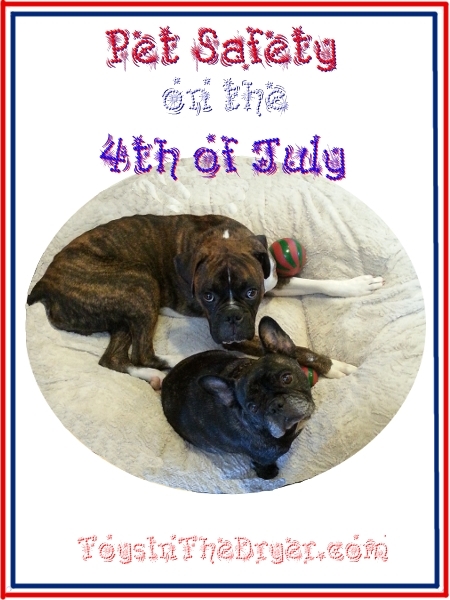 Remember pet safety on the 4th of July and have a Happy Holiday!